Tom Brady won April Fools' Day. 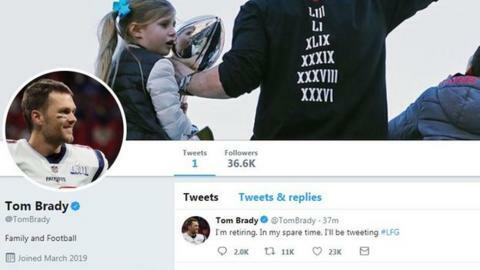 The six-time Super Bowl winner joined Twitter on Monday, announcing his arrival with a first tweet that read: "I'm retiring. In my spare time, I'll be tweeting." It seemed his team, the New England Patriots, and Twitter were in on the joke. The 41-year-old quarterback followed up his announcement an hour later by tweeting: "Was this a bad joke? ", with the Patriots responding with a meme saying "yup".